I almost missed it. I'm afraid I don't give poetry the attention it deserves, being more at home with prose. However, I have friends who are poets and who truly do know how to appreciate poetry. 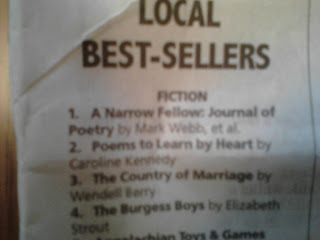 Two of these, Mark Lee Webb and Molly McCormack, have launched a new poetry journal, published twice a year, called A Narrow Fellow. The first issue was released this month. Samples of some of the poems can be seen here. The Giveaway will run from today through next Sunday, May 5. It's open internationally. To enter, just leave a comment below with an email address so I can contact you. 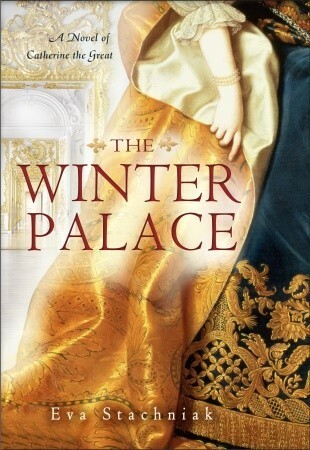 The Winter Palace by Eva Stachniak is a fascinating book about Russian court intrigue and bedroom politics set during the reign of Empress Elizabeth. (The book opens in 1743.) The narrator is Varvara Nikolayevna, a spy or "tongue," in the empress’s court. Although originally noticed, then trained and partially seduced by the Russian chancellor, she is presented by him to Empress Elizabeth as a tongue of exceptional talent. The chancellor expects Elizabeth to make use of Varvara, but he expects his protégée’s first loyalty will always be to him. But that’s in the future. This is Varvara’s story. She is a compelling character in her own right. As a spy, a champion eavesdropper who has the empress’s permission to snoop, Varvara is able to provide all sorts of information to the reader that most first person narrators cannot reasonably access. If done clumsily, the book wouldn’t have worked, but Stachniak is able to make Varvara a convincing "tongue," one that the reader can empathize with, and all her information is smoothly—though certainly not effortlessly—obtained. Through Varvara’s eyes, we watch as Empress Elizabeth becomes disenchanted with the bride she has chosen for Peter. The two youths are not suited. As they grow into young adults, they choose their own friends and lovers at court. 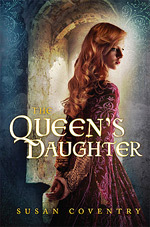 Catherine is tasked with producing an heir, something she must achieve despite her husband’s disinterest. Everyone at court is involved in everyone else’s business. Important figures rise and fall, and Varvara takes note of them all, passing on whatever information she thinks is most useful to her goal, which has become protecting Catherine. This is our historical fiction/history book club’s selection for our next meeting. 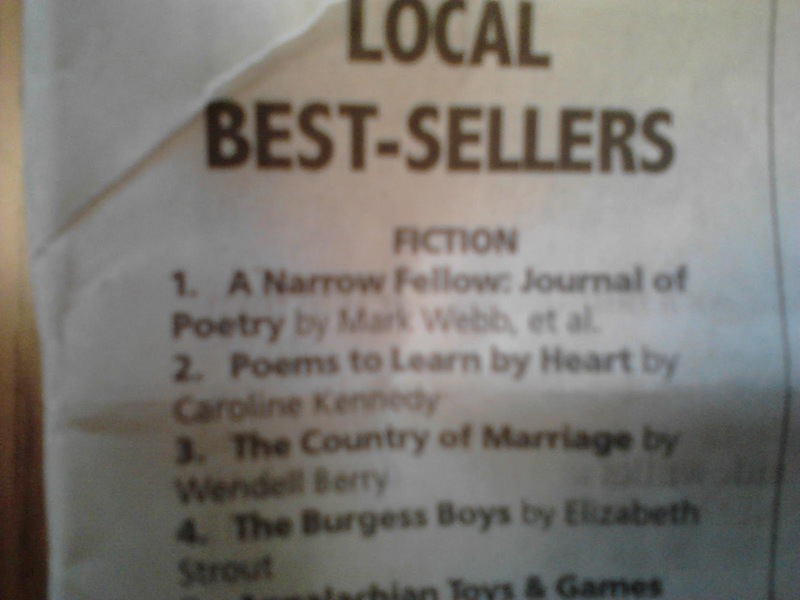 I was pleased with the choice because it’s billed as "a novel of Catherine the Great." I know very little about this famous historical person, and thought the book might be a nice fictional introduction. It isn’t what I expected. It is a very nice introduction to Russian dynastic history–what happened before Catherine the Great came to power (although it focuses very much on what is going on inside the palace. There is very little "big picture" history.) It’s a good set-up for Catherine’s reign. And I enjoyed the book very much for all its strengths and for the glimpse of Russian history that it did show me. But I think I’d prefer to have known going in that I wasn’t really going to be learning about Catherine the Great–what made her great. This does make a good prequel to the next novel which will surely deal with Catherine the Great’s reign. However, the ending of this book was satisfying as it stands. As much as I enjoyed this novel, I think I might move on to Massie’s biography to read about Catherine. 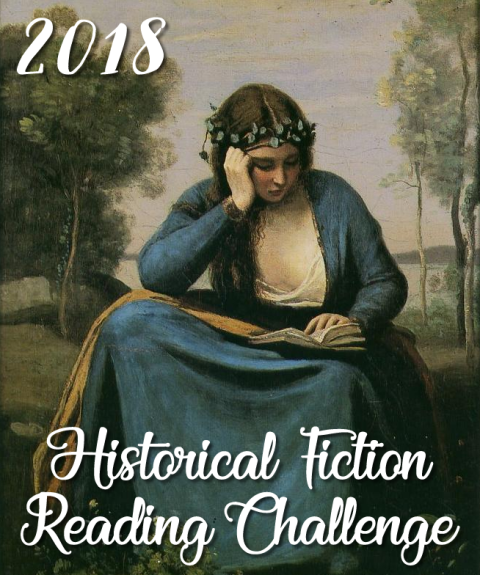 This is my 9th book for the historical fiction challenge hosted by Historical Tapestry. Once upon a time (in college), I was a Hemingway fan, although probably a lukewarm one. I loved The Sun Also Rises, but I found the few others I read to be less memorable. (Maybe that means I should try again. My memory is pretty poor.) 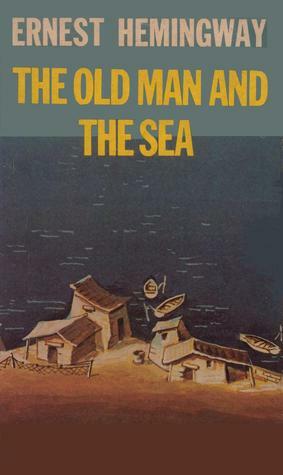 One book I always intended to read but never got around to was The Old Man and the Sea. It’s the last book published in his lifetime and it was awarded a Pulitzer, so it’s an important addition to Hemingway’s canon. Still, the topic–an old guy goes fishing–didn’t grab me. Yet it’s always bothered me that I haven’t read it. 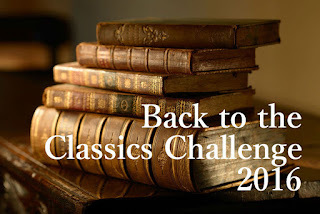 So, for my Back to the Classics Challenge, 20th century choice– it’s The Old Man and the Sea by Ernest Hemingway. Does everyone know this story? An aged, unlucky but still crafty, Cuban fisherman has not caught anything in eighty-four days. He had an apprentice, but this boy/young man has been ordered away to work with a luckier crew, so the old man is now all alone. On the eighty-fifth day, he sets out for deep water, his usual practice, and this time. . . I probably should leave out the spoilers, despite how well known this tale is. Let’s just say, there is an epic battle of old man against the fish he wants to catch. I don’t know anything about this sort of fishing, but I can say that the narrative is an odd mixture of dull yet tension-filled, and richly detailed yet not very credible. He spends a long time trying to bring in this fish. Things don’t end well, but, considering where the story started, and how badly it might have ended, I suppose it didn’t end as badly as all that. So in some ways, it seemed almost pointless. In other ways, it is remarkably heroic. Of course, Hemingway always has a point to make. There is enough here that literary critics (and high school and college students) have been picking The Old Man and the Sea apart for more than fifty years. It’s everything from Christian allegory to a depiction of Hemingway himself, with fishing representing the writing process. I suppose a true Hemingway fan could read this book over and over and find something new in it each time. It was a fine tale. Just what I expected. But I think once will be enough for me. Come see what classics we're reading at the Back to the Classics Challenge hosted by Sarah Reads Too Much. 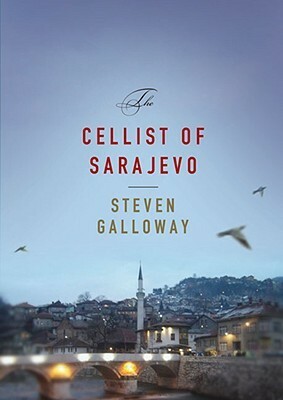 Quite some time ago, this review of The Cellist of Sarajevo by Steven Galloway, posted by Sam at Tiny Library, convinced me that this was a book I had to read. I didn’t want to put it on my mental TBR list and forget about it, so I bought the book. Unfortunately, it then became one of the books on the stack. 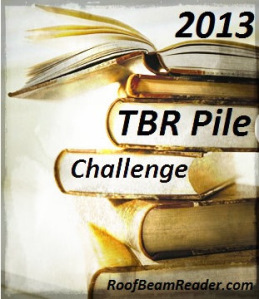 But, thanks to Roof Beam Reader’s 2013 challenge, I plucked it off the TBR pile. While the cellist is playing, the book primarily follows the lives of three people who live in the city under siege. First, there is Arrow. This young woman is an exceptionally skilled sniper. She not only has a talent for hitting her target, but also a gift of intuition. She is aware of her surroundings in a way that keeps her alert to danger. She can anticipate the moves of her enemy. Arrow is an asset to the besieged as a countersniper in every sense but one–this far, she has refused to blindly follow orders. She cannot bear to sink to the level of the "people on the hills" who kill indiscriminately. And yet, with increasing pain and numbness, she feels her real self, her humanity, slipping away. In her dual role as sniper/defender of the city, Arrow sees more corruption and less humanity wherever she looks, and she is beginning to believe the fight is already lost. She fears there is no longer a difference between them and us. The second character is Kenan, a youngish husband, father, and reluctant good neighbor to an embittered elderly woman. Keenan has escaped conscription into the army and his life revolves around a series of harrowing hours-long journeys to the local brewery, the sole remaining source for potable water. He carts as many plastic jugs as he can carry strung around his neck while hoping to dodge snipers as he makes his way through the most dangerous streets of the city. And back again. Every four days. He lives in dread of that fourth day. Finally, there is Dragan. This older man managed to send his wife and son to safety in Italy before the siege. Dragan didn’t leave for reasons people don’t leave. Now, he wishes he had, and yet, he still believes he couldn’t leave his home. Dragan is fortunate to have a job in a bakery which exempts him from the regular army and means he doesn’t have to wait in bread lines. But he does have to walk to and from work every day. And so, every day, he faces the possibility of random death–in fact, he sees people shot at and sometimes killed, crossing the streets he must cross. How, in the face of this, do people find the courage to go on? In beautiful written, haunting chapters, Galloway shows how different characters do find that courage, each in their own way. And it shows how each of them draws strength in a different way from the cellist’s courageous gift of music and hope. Lindsey Leavitt hooked me with Sean Griswold’s Head, so I thought it likely I would read whatever she wrote next. Then, when I saw the blurb in anticipation of its release several months ago, I was so eager to read it I did a WOW post and pre-ordered it. 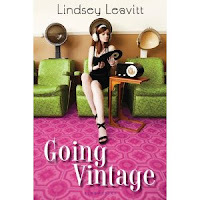 Going Vintage is a YA contemporary narrated by the sweet but somewhat scattered Mallory, a California High School junior who, as the book opens, defines herself by her boyfriend. Mallory has been dating Jeremy for over a year. They love each other as desperately as only seventeen-year-olds can, which means spending a great deal of time making out. Mallory enjoys this but also gets a bit bored with it. So, one evening she interrupts the activity to get back to the homework they were supposed to be doing, but first sends Jeremy to fix her a snack. While he’s gone, she opens up his computer to get started on the homework. He hadn’t closed his "Friendspace" page. Mallory gets an eyeful. Jeremy has been cheating on her with a cyber girlfriend named BubbleYum. At home, Mallory is helping her grandmother to move into a retirement community. While sorting through her grandmother’s belongings, she comes across a to-do list - circa 1962. It includes things like: Run for pep-squad secretary and sew a dress for homecoming. These things are so uncomplicated, so pre-2013, so comforting, that Mallory decides the cure for what ails her is to return to the good old days–the days before technology ruined teenagers’ lives. The fact that "Friendspace" is agog over the Jeremy-Mallory split, rumors are flying, and her name is mud, makes the renouncing of at least some technology sound like a very good idea. But Mallory jettisons it all: computer, cellphone, modern clothes, even her alarm clock. She adopts her grandmother’s list for her own. Mallory is going vintage. This is a cute, fast-paced story. Mallory is a believable protagonist. She’s self-absorbed but comes around before it gets too annoying that she’s missing some pretty obvious clues of other people’s distress. She has parental problems, but the problems are pretty mild and she’s able, in the end, to recognize what’s important. She has an awesome younger sister who just about steals the show, and Mallory is smart enough to adore her. Mostly she has boy troubles–the book is about overcoming boy troubles by finding yourself. Z. A Novel of Zelda Fitzgerald by Therese Anne Fowler is the type of historical novel I truly enjoy. 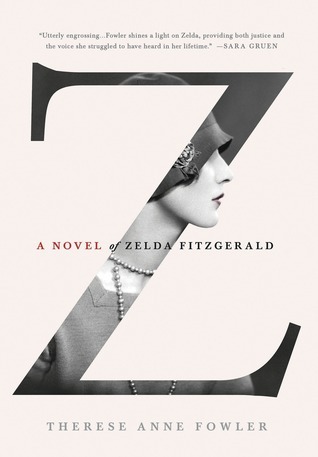 Steeped in the time period (centered around the roaring twenties) with lush details of varied settings (Montgomery, Alabama, New York City, Paris, and various other post-war European cities), its easy to feel the excitement and confusion of Zelda’s whirlwind lifestyle and the inevitable exhaustion. Zelda Sayre was barely eighteen when she met and fell in love with F. Scott Fitzgerald, a young army lieutenant stationed in Montgomery. In many ways they were mismatched. He was a Yankee, for one thing. He intended to be a writer, for another. But they were both passionate, young, adventurous, and full of life. He had just shipped overseas when the armistice was declared, "cheating" him of a chance to see any real fighting. He returned to Montgomery to propose to Zelda. Although she accepted him, he had to be able to support her first, so he returned to New York alone to find a job and work on a novel. For a while, it seemed the marriage might not happen. Fitzgerald’s first novel sold to Scribner’s and Zelda hopped a train to New York to get married–against her parents’ wishes. The wild lives of Scott and Zelda began. The two were celebrities in their time, known for outrageous behavior, late nights, reckless spending, hard drinking, hopping into public fountains. . .the novel shows it all. It’s part act--publicity stunts to garner attention for Fitzgerald’s writing--and part two young lovers having fun. Fowler does a wonderful job with the psychology of a young woman who is very much in love with her husband but is dealing with his success and insecurities, financial worries, and her own transition to adulthood. 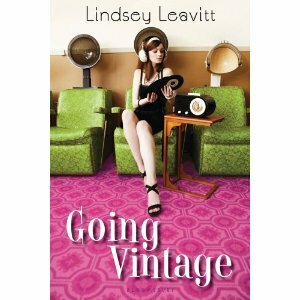 Scott and Zelda escape New York and travel to Europe, eventually ending up in and around Paris where they fall in with the expatriate literary crowd. 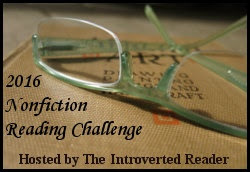 Some of the story here is familiar territory, having been covered from a different woman’s perspective in The Paris Wife by Paula McLain (a book about Hemingway’s first wife that I also enjoyed.) But Zelda is not as content to simply play the role of supportive wife. She has ambition of her own. She’s intelligent and talented, but suffers from a lack of focus. She also suffers from a husband who believes that he should be her only focus. And so, the story becomes one of a marriage in crisis. (Hemingway comes off as awful in this story as he does in The Paris Wife, if not worse.) Yet, despite their difficulties, they remain married. Another piece of Zelda’s history is her mental illness. Fowler uses what is known about Zelda’s breakdowns and her institutionalizations to create a credible narrative of her mental illness. It avoids assigning blame (as in--did Zelda drag down Fitzgerald’s writing career or did Fitzgerald’s alcoholism and self-centeredness lead to Zelda’s breakdown?) but shows how multiple missteps along the way, years of little misunderstandings, can wear down even the strongest spirit. But, in spite of it all, they remained devoted to each other. Unless that was a fiction too. My final spring break book was not exactly a beach book. I wanted to work on my Back-to-the-Classics challenge, so I downloaded Middlemarch by George Eliot onto my ipad (trying to travel light). What a great choice! Middlemarch is an extraordinary book. I don’t necessarily recommend the free kindle version. It’s a bit hard going at first. It has an old fashioned, almost "dear reader" style as the narrator sets up who’s who and what’s what in the provincial Midland town of Middlemarch. It’s a long book, and my version didn’t have page numbers, just a vague kindle "quantity" of 12795. I’d been reading for quite some time only to find myself 2% done and I began having second thoughts. I prefer actual pages so I can judge better how far along I am and how much farther I have to go. But, I shouldn’t complain when I had the convenience of an easily portable classic for free. And, it didn’t take long before I was so engrossed that I couldn’t put the ipad down. Middlemarch is chockfull of very real people that are so well portrayed, I needed to know what was going to happen to them. 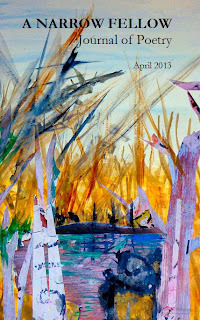 Dorothea Brooks is our primary heroine. Stubbornly selfless, intelligent and beautiful, Dorothea wants to learn everything so she can do something great. She sees her chance when she meets a learned man more than double her age who has been spent his life on a study of mythology. His health and eyesight are now failing him. Dorothea believes that as a wife and helpmeet she can further his work. Although he never saw the need for a wife before, he can appreciate Dorothea’s devotion to him. Despite everyone’s better judgment, they are wed. It doesn’t take long for the marriage to become a prison for Dorothea. A hero of sorts in the story is Dr. Lydgate. A young man come to town with high ideals and a passion for his profession, Lydgate is not wealthy, but he is well-born and that attracts the attention of a beautiful young social climber, Rosamunde Vincy. Rosamunde and her brother, Fred, have been raised to think very highly of their own merits and to be dismissive of others. Rosamunde has had plenty of suitors, but finds no one in Middlemarch good enough. She sets her cap for Dr. Lydgate, primarily on the strength of his family connections. She doesn’t have much interest in the things that he cares deeply about. Fred is a lazy young man. His father sent him to the university to be trained for the church, but Fred failed his examinations. Fred finds this to be of no real concern since he cannot see himself as a churchman anyway. And, he has a rich uncle who has no children. Everyone knows Fred is favored to be the heir. In the meantime, Fred is in love with Mary Garth, a plain and sensible young woman who is nurse to the ill-tempered old uncle. Mary loves Fred, but she can’t marry a man as useless as Fred seems destined to be. These storylines are all carefully developed and then interwoven. We meet the family, friends, and co-workers of these main characters. We cheer for their successes but more often cringe for the problems that befall them, often the result of their own mistakes. There are very good people in Middlemarch, others who are all too human, and some who make life miserable for everyone else. The book examines the politics of the time, reform–both political and medical, religion, and the role of women and of marriage. It’s a hefty book, but it reads very easily because it’s all bound up in the lives of several fascinating characters. 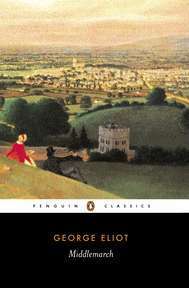 This is the first George Eliot book I’ve read, but it won’t be the last. 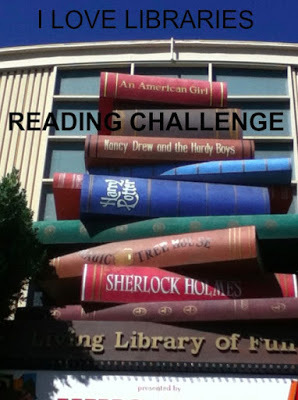 And it's my second read for the Back-to-the-Classics Challenge, hosted by Sarah Reads Too Much. We spent spring break in the Bahamas! After starting off with The Narrative of the Life of Frederick Douglass, An American Slave on the plane, I wanted something lighter to take to the beach. 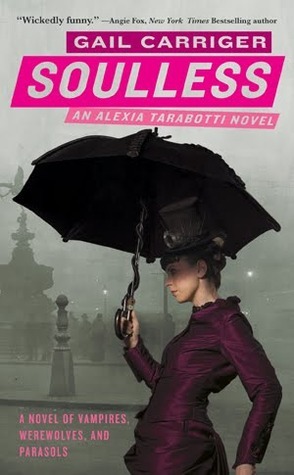 Soulless by Gail Carriger was on my TBR pile list, so that went into my suitcase. I bought this book nearly three years ago, curious to explore the genre-bending steampunk, comedy-of-manners, Victorian romance. Why has it languished on my shelf? It has an original premise, a delightful protagonist, and an entertaining plot. Alexia Tarabotti is a twenty-five-ish, half-Italian bluestocking. Her father is dead and her remarried, flighty mother and two attractive younger sisters despair of her, knowing that no man will ever be interested, since she does not fit conventional ideas of female beauty. Alexia has resigned herself to spinsterhood, but is independent enough not to let that bother her. The set-up so far is typical romance fare–the difference is that in this Victorian England, vampires, werewolves and ghosts live in harmony with mortals. In fact, some of the cream of society are supernatural beings. Alexia is not one of these; she is the opposite. She is preternatural. She has no soul. Being soulless means that vampires and werewolves have no power over Alexia. In less enlightened times, preternaturals hunted supernaturals, but today, it is the preternaturals who are the oddity and who keep their identity somewhat secret. Alexia is registered with the governmental agency that keeps track of these things, but polite society only knows her as an unmarriageable female and that’s bad enough. Bad enough–and then, Alexia accidentally kills a vampire at a ball. The vampire does not belong to any of the known London hives. Lord Conall Maccon, head of the London BUR (Bureau of Unnatural Registry) and a werewolf, arrives to investigate. Alexia and Lord Maccon have had embarrassing run-ins before, but nothing of quite this magnitude. He is extraordinarily masculine and handsome and although he finds her quite the troublemaker, he isn’t as put off by her looks and her advanced age as most men of her acquaintance. He’s disturbed by the unknown and now-dead vampire and what it all might mean. But he most definitely doesn't want Alexia to get mixed up in it any more than she is. Of course, she does. Before long, the two learn of more vampire appearances and disappearances and threats against lone werewolves as well. A mystery must be solved as romance blooms in unlikely circumstances. The characters are amusing and the whole thing is a lot of fun. The world that Carriger creates is a lively and fascinating one and so fully imagined that I could whole-heartedly immerse myself in it. If there are going to be vampires and werewolves and such, let them be just like this! 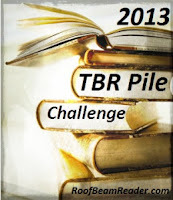 The TBR pile-challenge is hosted by RoofBeamReader. 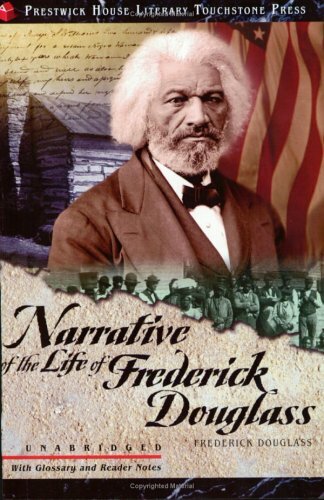 For my "Classic that relates to the African-American Experience" I chose Narrative of the Life of Frederick Douglass, An American Slave, written, of course by Frederick Douglass, although at the time of its publication (1845), detractors attempted to say that the book was too well-written to have been composed by a self-taught slave. It’s a compact narrative that relates the story of Douglass’s life as a slave from childhood until his escape. Douglass's situation changed a few times. He was primarily a city-dwelling slave, in Baltimore, although he briefly was sent to work in the fields. His explanations of how slavery lowers both slave and master are insightful and sad. An eye-witness account, it's a convincingly wrenching condemnation of slavery. The beatings, humiliation, tearing apart of families, the sexual brutality– it’s all there, laid out in straightforward, matter-of-fact prose that is somehow more horrifying with its lack of sensationalism. Much of this narrative and Douglass’s personal philosophy does not seem particularly new, but I think that’s because so much of it has been incorporated into what we now know about slavery and how we view it. I can see how it would have been a revelation when it was published, at a time when many still tried to turn a blind eye to slavery’s evils or to pretend that many slave owners weren’t really that bad–as if there could be gradations of something so wrong. One thing that surprised me, and brought home to me even further the reality of Douglass’s position, was the abruptness of his "escape narrative." There is none. He decides that he must run away. He makes his plan, but doesn’t give much detail beyond the fact that he is storing up the little bit of money he can get his hands on and lulling his owner into a false sense of security. And then, he is in New York. All he tells us is that the escape proceeded smoothly. He does not explain how he did it or mention who helped him because he doesn’t want to close the door behind him, cutting off the route for those who might follow. Also, telling what happened would be dangerous for those left behind. And, dangerous for him. He could still be caught and returned to his owners in Baltimore. For me, used to stories where the tension of the slave escape is a large part of the tale, for a moment, I felt like a chunk of the story was missing. But then I remembered that he was publishing this in 1845–in the midst of an ongoing fight. His own narrative was not yet completed. Douglass, and his book, still had a large role to play. 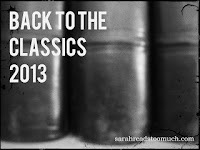 The Back-to-the-Classics Challenge 2013 is hosted by Sarah Reads too Much.